Have you ever wanted to track beyond just page views and visitors? It is very important to figure out whether your website is actually helping your business or not. Here Google Analytics does a great job. But to get actionable metrics out of Google Analytics, you need to set up a few things first. One of its prime features is tracking your goals and then its conversions; goals may be anything, ranging from the Purchase of a product to the completion of an email list sign up or Download of an eBook. In order to set up a goal, you’d need to first go to your website’s profile in Google Analytics and click on the “Admin” tab: you’d find here a tab for Goals. Click on the +Goal link to begin adding goals. 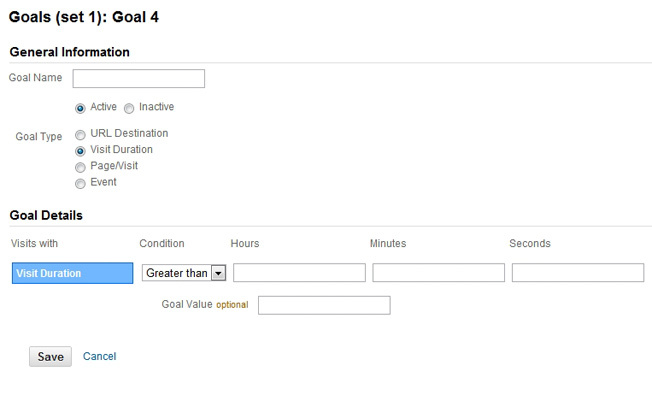 Enter a short, descriptive name for your goal and then select the goal type. The two most useful types are the URL Destination and Event Type. Note: You’re allowed only 5 sets of goals with 5 goals in each set. You don’t get to delete a goal and set up something new – so you’d better be choosy about what you put in here. You can also turn the goal “on” or “off” with the “active” or “inactive” options. This is because Google Analytics permanently applies the goals against your organization compiling data for generating your reports. Here are a few typical goal types on which you may want a comprehensive report/data. URL destination goals help you to keep a track of specific URLs. Each time a visitor goes to that URL, they trigger the goal. These are ideal for thank you pages, confirmation pages, and PDFs. Goal URL: Do not enter the full URL, use only what comes after the domain; e.g. if the full URL is www.example.com/pricing, enter just enter in “/pricing”. 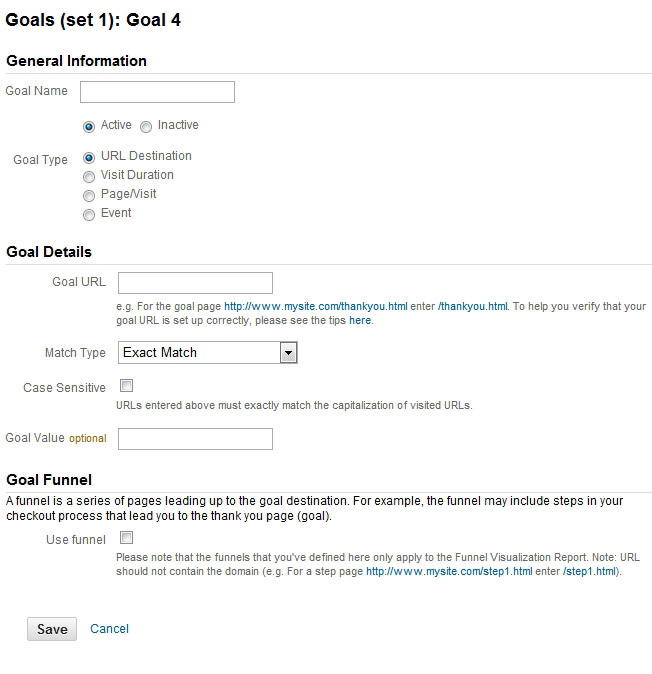 Match Type: This field helps you understand the match level vis a vis what you typed under the ‘Goal URL’, determining how stringent Google Analytics is when deciding if a URL counts. For an exact match, only the specific URL will work and nothing else. If there’s a query string or a unique ID for the session at the end of the URL, it wouldn’t take that into account. Thus, it is advisable for you to not use the ‘Exact Match’ option if you have a system that’s constantly generating unique URLs for each visitor. ‘Head Match’, another option under the “Match Type” tracks any visits to the URL regardless of what comes after the URL. If you make heavy use of query parameters or session IDs, definitely pick head match. ‘Regular Expressions’ are for the analytics pros. The ‘Regular Expressions’ let you define your URL however you want. The downside is that they’re super complicated. Case Sensitive: Generally, this field should be unchecked; check this box only if lowercase and uppercase characters are present in your URL. Goal Values: This is an optional field. Goal Funnels: Goal funnels allow you to see exactly how many people move through each step of your marketing process. You’ll know how many people abandon your funnel at each step, thereby helping you understand exactly what are the pages that need fixing. For example, build a goal funnel for your ecommerce checkout to see how many people move through each step between the shopping cart and the payment page. You’re limited to 10 steps in your funnel. So if you need more, split the funnel between two different goals. This one’s pretty simple. You can use this to track how many people stay on your site for a certain amount of time. Also, you can set the goal to track every visit that’s below a specific amount of time. This is useful for support sites that are trying to help customers answer their question as fast as possible. Under the ‘Goal Details’ section, you are given specific description of some key fields, which in turn would help you set up the details of your goal. Hours, Minutes, and Seconds: Specify the exact time you want to use for the goal. Most sites use 5 minutes here. It doesn’t really matter what time you choose. For capturing the best data, set up a time which not everyone reaches, say, for example seven minutes. Remember, if too many people activate the goal, you would not be able to figure out how to improve your site. Say someone comes to your site: they visit your page and a time stamp is collected; when they click on a second page, there’s a second time stamp which is collected. The analytics is done by comparing the two timestamps with hich we know how much time someone spent on that first page. But what if they leave after the second page? Well, we have no idea how much time they spent on page two. Without another timestamp, we can’t figure it out. Does this mean the visit duration data is worthless? You should assume that the time on site metric is VERY different from how long people actually spend on your site. But we can still gain insights by comparing the metric over a period of time. If you have a site where the visit duration is critical (like support sites) look for trends in how this metric changes over months. 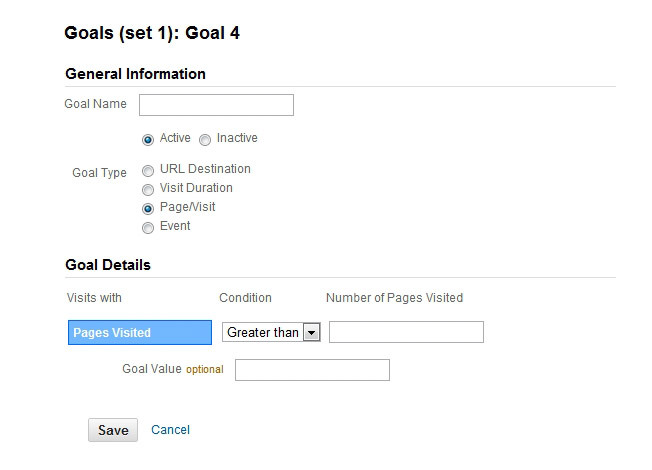 Pages/visit is another easy goal type. In this case, instead of tracking how much time people spend on your site, this goal tracks the number of pages each visitor sees before they leave. Condition: Our three choices are “greater than,” “equal to,” or “less than.” Just for visit duration, pick “greater than” if you’re measuring engagement and “less than” if you want to measure the effectiveness of your support site. Number of Pages Visited: Simply set the number of pages that you want to activate this event. Event goals are a little more complicated as you have to set up the events. Once you have the events ready, you can easily select any event as a goal. Step 1: When you set up an event, you define it with a category, action, label, and value. 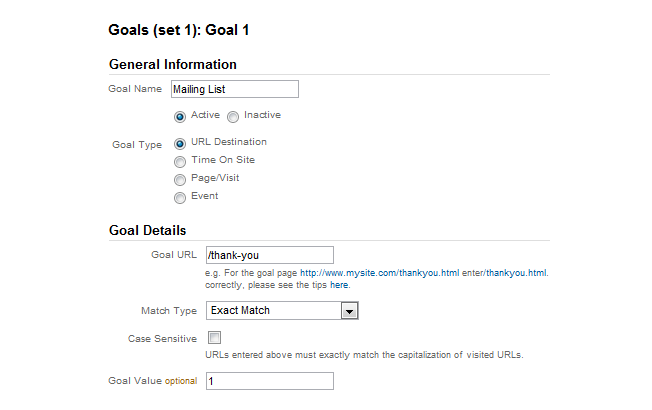 Using the dropdowns, specify which of your events should be counted as goals. You can use as many of them or as few of them as you want. The event goal will only trigger if the event matches EACH one that you’ve defined. So if you only define the category, the goal won’t care about actions, labels, or values. But if you define all four, the event will match all of them for the goal to activate. 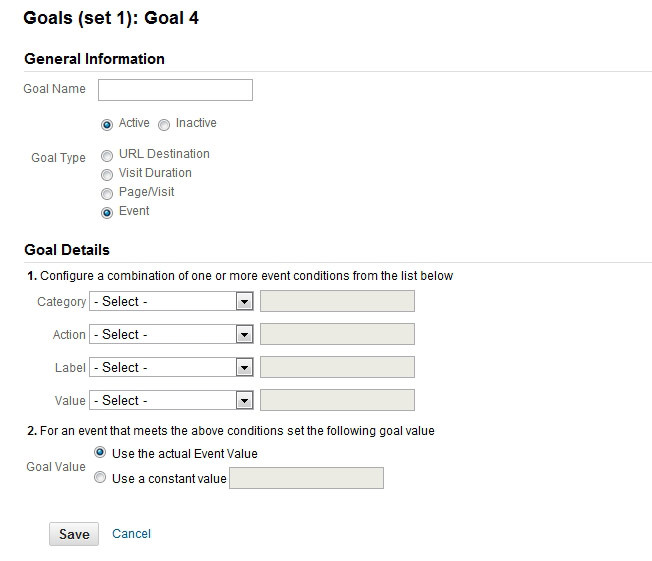 Step 2: You can also decide whether you want to use a new goal value or to use the event value as the goal value. Generally, use the event value if that value is directly tied to revenue. If not, use a new goal value, or leave the goal value blank. Warning: You can’t use event goals in a funnel. Every step of the funnel needs to be a URL (including the goal). So if you want to build a funnel from steps that doesn’t have unique URLs, you’ll need to use those virtual page views. Anything else that helps you to generate income. So get started! Once you’ve set up goals.